Perfection in the West End! 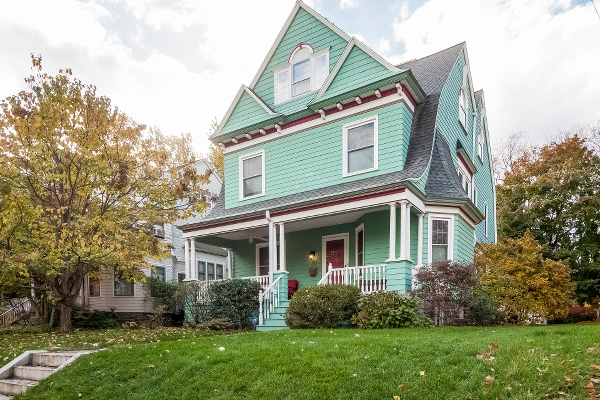 This 1897 home was designed by William H. Scoville, a popular architect for the time period, and has been renovated from top to bottom for today’s living. The bright and open floor plan provides a contemporary feel, while all of the classic architectural elements remain. A sizable foyer features a seating area to welcome your guests. The oversized formal living room offers a large bay window and working fireplace. The dining room has a built-in corner cabinet and flows into the kitchen and living room for easy entertaining. The gourmet kitchen has been fully renovated and opened to the dining room. It offers granite counters, stainless steel appliances, a breakfast bar, and an abundance of cabinet space. A dedicated mudroom and renovated powder room complete the main level. On the second floor, the large master bedroom offers a full spa bath and walk-in closet, complete with organization system. The master bath has been remodeled and features a tile shower, soaking tub, his and her vanities, and heated radiant slate flooring. There are three additional bedrooms, one of which has been converted to a laundry room and additional closet space, as well as a renovated full bath offering a tile shower and tub. A clever custom bookcase conceals the door to the third floor. Walk up to see a stunning expansion of space. Large windows and a vaulted ceiling make the huge open room a favorite gathering place. Many possibilities include a great room, play room, office space, or even a master suite. There is also an oversized finished closet space with built in shelving and a powder room. Outside, a paver patio leads to a fully fenced backyard and detached 2-car garage. A charming, open front porch offers more outside space. The home has a new high efficiency Buderus gas boiler and gas hot water heater, central air conditioning, new windows throughout, and 200amp, buried electrical service. 133 Kenyon Street is offered at $525,000. If you’d like to see this home, please have your agent arrange a showing, or call me at 860-655-2125 to schedule a visit. More details and a photo tour are available.